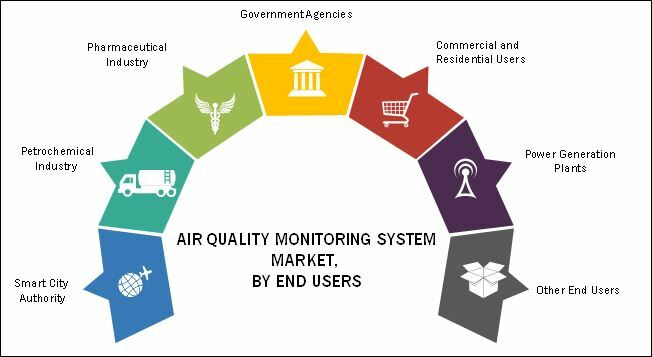 [174 Pages Report] The global air quality monitoring system market is segmented by product, sampling method, pollutant, end user, and region. Based on product, the air quality monitoring system market is segmented into indoor monitors (comprising fixed and portable monitors), outdoor monitors (comprising fixed, portable, dust, particulate monitors as well as AQM stations), and wearable monitors. The outdoor monitors segment is expected to witness the highest growth rate during the forecast period; owing to attributed to the rising industrial use of ambient air pollution monitoring systems, expansions in the end-user base of fixed outdoor monitors, and ongoing installations of AQM stations across major markets. 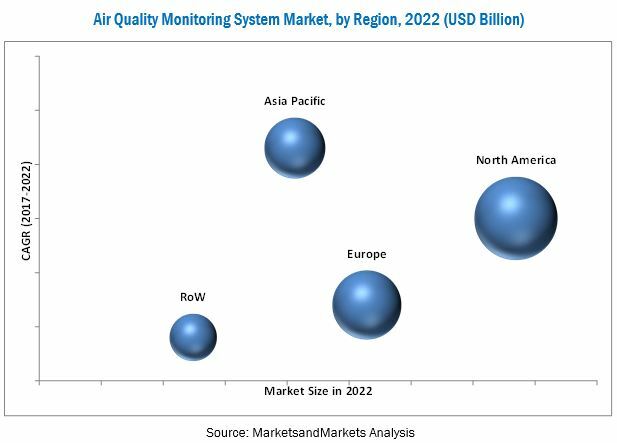 The global air quality monitoring system (AQMS) market is projected to reach USD 4.90 billion by 2022 at a CAGR of 4.6% during forecast period. The major factors driving the growth of the air quality monitoring system market include the supportive government regulations for effective air pollution monitoring and control, ongoing initiatives towards the development of environment-friendly industries, increasing public-private funding for effective air pollution monitoring, rising levels of air pollution, and increasing public awareness related to the environmental and healthcare implications of air pollution. As of 2016, Thermo Fisher Scientific (US) held the leading position in the global air quality monitoring system market. The company possesses a robust AQM portfolio that includes products for ambient gas monitoring, emission monitoring, and particulate monitoring and has a strong geographic presence across North America, Europe, APAC, and Africa. The company primarily focuses on new product launches and product enhancements as its key growth strategy to sustain its leadership position in the air quality monitoring system market. Also, Teledyne Technologies, Inc. (US), Siemens Ltd. (Germany), Emerson Electric Co. (US), and General Electric (US) were few other key players operating in the market. Portable indoor monitors are personal/mobile-use devices that are generally used by individual professionals or a small group of workers for IAQ monitoring. These devices comprise handheld or lightweight platforms that cover a small study area and are intended for indoor usage only. Portable indoor monitors provide a relatively affordable option to end users as compared with fixed monitors, and offer ease in locating the exact source of pollution. In 2017, the indoor portable monitors segment accounted for a share of 39.7% of the indoor air quality monitors market, largely due to the increasing adoption of smart home and green building technologies (including effective ventilation, AQM and control, and indoor dust and gas level management) and growing consumer preference for healthy and pollution-free indoor environments. 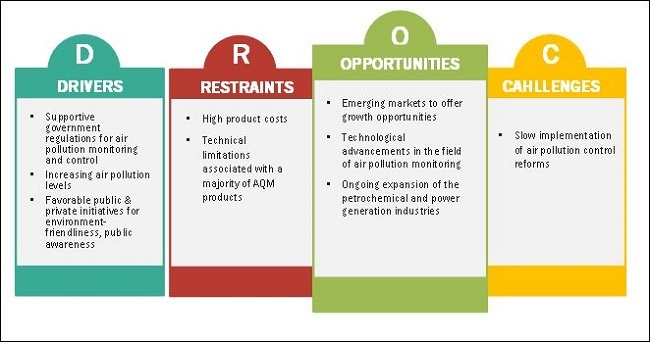 Air Quality Monitoring System Market growth is further aided by the presence of stringent environmental regulations as well as the continuous development and commercialization of innovative technologies in this field. Emerging markets (such as India, China, Brazil, and Russia) are expected to offer significant growth opportunities to Air Quality Monitoring System instrument manufacturers and distributors during the forecast period due to the rising pollution levels in these countries coupled with increasing public awareness, increased consumer expenditure due to population expansion and rising disposable incomes, and greater government expenditure for effective Air Quality Monitoring System across emerging countries. Government agencies and academic institutes are major end users of Air Quality Monitoring System products. Due to the presence of stringent environmental regulations mandating the adoption of effective air pollution monitoring and control strategies among major industries, this end user segment will register the highest growth rate in the air quality monitoring system market. In addition, the growing installation of AQM stations across emerging countries is expected to support the growth of this end-user segment in the coming years. Smart city infrastructure involves the extensive use of advanced technologies to offer improved public amenities. Smart city authorities across the world are increasingly utilizing a network of products that enable real-time monitoring and control of various air quality parameters. Implementation of stringent AQM regulations, rising urbanization and air pollution levels, and government investments for AQM and air pollution control is the prime reason for this end user segment to register the highest growth after government end users. Growing awareness on the link between air quality deterioration and health disorder prevalence has prompted builders, architects, and engineers to focus on the effective management of indoor air pollution levels. This includes the use of green building and smart home technologies, incorporating AQM into their designs to ensure the accurate assessment of indoor air quality. The major effluents released in the air from operations in the petrochemical industry include ÍÏ, ÍÏ2, NOx, SO2, H2S, CO, volatile hydrocarbons, and PM (PM10 and PM2.5). To control and monitor effluent levels, the petrochemical industry utilizes continuous and intermittent sampling methods. Growth in this end-user segment can be attributed to that of the petrochemical industry, coupled with government regulations aimed to reduce air pollution. Power generation plants (such as coal and gas-fired units) are among the major contributors to air pollution levels worldwide. Therefore, to monitor and control effluent levels released into the air, power generation plants utilize continuous as well as passive AQM. The pharmaceutical industry is among the major sources of air pollutants, such as toxic gases (including hydrogen sulfide, water vapor, and methane), PM, and microbial contamination. Hence, governments have implemented mandatory regulations for the assessment of both indoor and ambient air quality parameters in pharmaceutical manufacturing units. What are the key growth strategies adopted by major global players to penetrate and maintain their market position across emerging and established regions? What is the developmental pipeline for portable/wearable AQM systems? Wearable air quality monitors are an emerging trend in air quality assessment. What revenue impact will it have on the overall air quality monitoring system industry during the forecast period? What different approaches are currently being used for rare gases/chemical pollutant monitoring worldwide? What revenue impact will multi-component/multi-functional AQM systems have on growth potential of the overall air quality monitoring system industry during the forecast period? Majority of chemical/analytical laboratories worldwide are focused on workflow automation. What growth potential revenue impact automated analyzers will have on revenue impact? The global air quality monitoring system (AQMS) market is projected to reach USD 4.90 Billion by 2022 from USD 3.92 Billion in 2017, at a CAGR of 4.6%. The major factors driving the growth of the air quality monitoring system market include the supportive government regulations for effective air pollution monitoring and control associated with the rising levels of air pollution, initiatives towards the development of environment-friendly industries, and increasing public awareness related to the environmental and healthcare implications of air pollution. Based on product, the air quality monitoring system market is segmented into indoor monitors (comprising fixed and portable monitors), outdoor monitors (comprising fixed, portable, dust, and particulate monitors as well as AQM stations), and wearable monitors. The indoor monitors segment dominated the AQMS market in 2017. Whereas, the outdoor monitors segment is expected to witness the highest growth rate during the forecast period. The large share of the indoor monitors segment is attributed to the increasing adoption of smart home and green-building technologies and growing consumer preference for pollution-free indoor environments. On the basis of sampling method, the air quality monitoring system market is categorized into five segments continuous, passive, intermittent, manual, and stack sampling. The continuous sampling method segment accounted for the largest share in 2017. This can be attributed to the implementation of supportive government regulations for effective air pollution monitoring across major markets, ongoing development of advanced continuous monitoring systems, and large installation base for continuous air monitoring stations. On the basis of end user, the air quality monitoring system market is segmented into government agencies and academic institutes, commercial and residential users, petrochemical industry, power generation plants, pharmaceutical industry, smart city authority, and other end users. The government agencies and academic institutes segment accounted for the largest share in 2017. The large share of this segment can be attributed to the presence of stringent environmental regulations, rising government investments for effective AQM, and increased installation of AQM stations worldwide. The report covers the AQMS market across four key geographies, namely, North America, Europe, Asia Pacific, and the Rest of the World (RoW). In 2017, North America dominated the market primarily due to the easy accessibility and fast adoption of advanced technologies among key stakeholders and the presence of stringent government regulations for effective pollution monitoring and control. However, Asia Pacific is expected to register the highest growth rate during the forecast period. Factors driving the growth in the APAC region include the large-scale industrialization in emerging APAC countries, increasing stringency of air pollution regulations, and continuous government support for the development and commercialization of advanced AQM products in this region. Factors such as high product costs and technical limitations associated with a majority of AQM products may restrain the growth of the AQMS market. As of 2017, some of the major players operating in this market are Thermo Fisher Scientific (US), Teledyne Technologies, Inc. (US), Siemens Ltd. (Germany), Emerson Electric Co. (US), and General Electric (US).